Vast, magnificent and inarguably breathtaking, the Zanskar Canyon is easily the most distinguishable “adventure” landmark – and a natural wonder that you simply have to see to believe. Stretching 105 kms from end to end, steep rocky walls standing majestically descend into the canyon’s frozen floors and just about a km deep the Chadar invites you with open arms, with the sun sparkling across the frozen river, with the delicate curls of the hidden Zanskar and with the warmth of the porters and the locals. 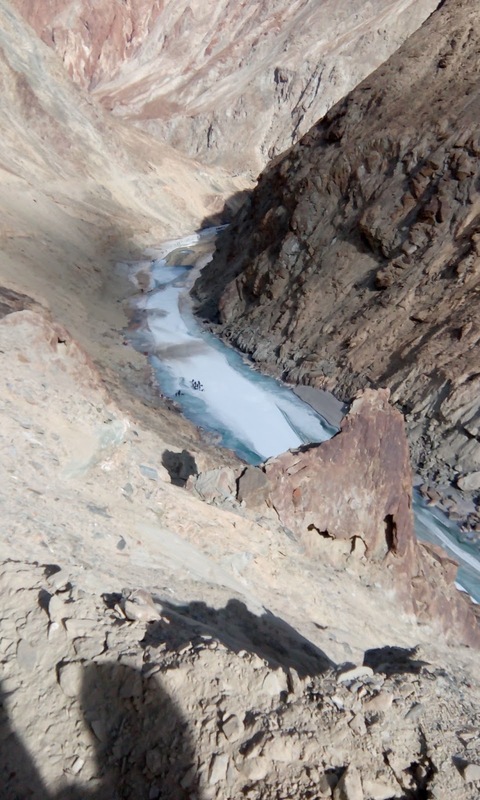 The Chadar has been the ‘easier’ way out of the region for the people of Zanskar. 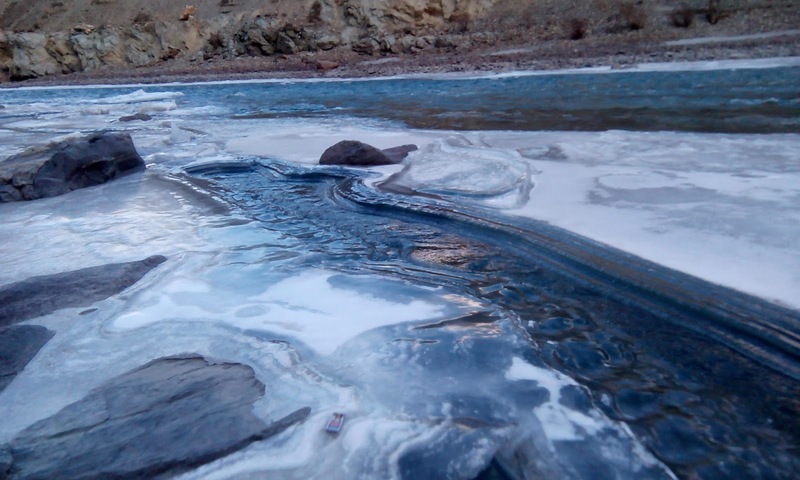 Locals wait for months for the river to freeze so that they can leave their villages swiftly, because although the journey across the Chadar takes between 3-5 days, the alternate route through the high mountain pass is even more herculean. Unfortunately, today one can witness the agonizingly slow process of blasting and bulldozing along vertical cliffs, triggering constant rockslides but that isn’t stopping the march toward “progress.” With this access will come the dark side of modernisation, of which the people of Zanskar valley have no concept or knowledge of how to deal with. The truth, and as over confident as I may sound, the extreme surroundings of the Zanskar valley are not impossible to beat. With several layers and sagacious trekking, the Chadar trek is a doable trek, but what makes it apart is its unique experience , the fact that you are so close to danger and the feeling of an intimate brush with destiny. Everything about it; the subzero day temperatures, the -30 degree C nights , the scenery, the atmosphere, the sledges, strange camp sites, cozy caves and the ever altering landscape. So unique that it has to be experienced & felt. Shital and I decided to set out once again and chose the god gifted perfect window of the second week of Jan 2017 to make the dreamiest of all our plans a reality. As we got into Leh we decided to stay put for the 24 hours to allow our body to acclimatize. Mountaineering stories all talk about the sense of glory achieved as one gains altitude , but most forget to note that the basics that we take for granted become difficult, breathing becomes tiring, eating ceases to be enjoyable and sleeping is an effort,but once we had accepted and welcomed our decision of choosing to spend the next few days in a natural freezer, it was time to meet our partners in crime. Meeting your group and co-trekkers, the people who will over the next few days become family is like ‘blind dating’. You are a hiker, strong and adventurous but aloof and independent, always looking for new projects but take failure pretty hard and you hope the person who walks in through the door into the cold, chilly, frozen yet ‘hospitable’ lobby of the trekking Inn is more like you or just learns to like you for the way you are. We were super lucky to have found this incredible mix to share our time with them. Trekking with people you learn to trust can be really motivating, they know how to push you to work harder and make it fun in the process. With backpacks efficiently stuffed and trekking poles out, our modern family of Shital, Kshitij, Samudra,Manish, Piyush, Abhishek, Shruti ,Anu, Suguna , Sushma ,Ashrita & myself are briefed to be led by two company guides and 2 local Ladhaki guides, both who have asserted my belief that the porters are super-human and that the X-men do exist . There were also 3 cooks and 10 porters, our angels who carry the luggage and provisions that cover every basic survival checklist. 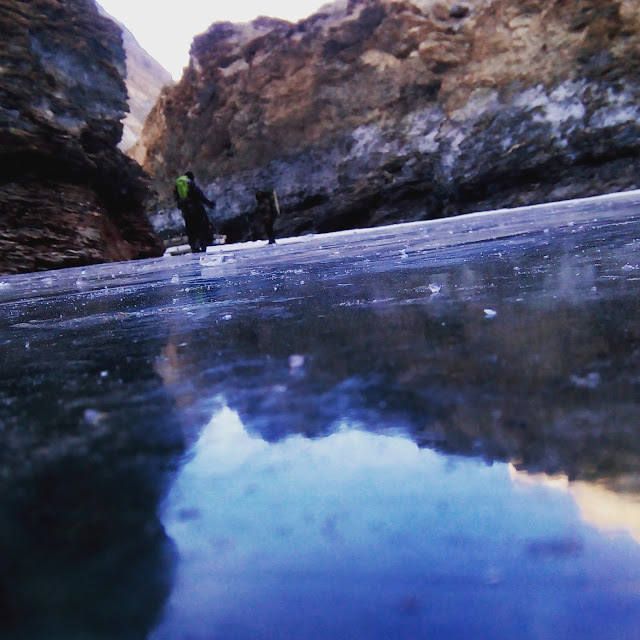 We set out with these angels on ice for a 2 hours drive from Leh to get to the part of the river where the trek begins. Once you cross the confluence of the Indus and Zanskar rivers you lose connectivity and from there,for eight days and eight nights we were sure to be completely cut off from the outside world. As we reach the end of the dusty dry road at Chilling, we hike the loose slopes right above and along the river. The climb is at first steep, but eases to a gentle slope and descent towards the river. 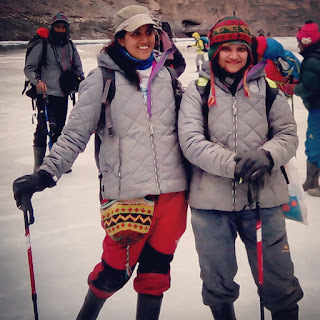 I take my first very carefully measured baby step onto the frozen Zanskar, there is a rush of confidence and self-achievement about the fact that it’s happening. My ‘acceptance speech’ even has a personalised cheer in the background, the zeal and anthems of the porters who gear up to zip and zoom. The whole modern family is all set to spend 7 days and 7 nights on the Chadar and make it to Neerak to celebrate the grand finale as a team. 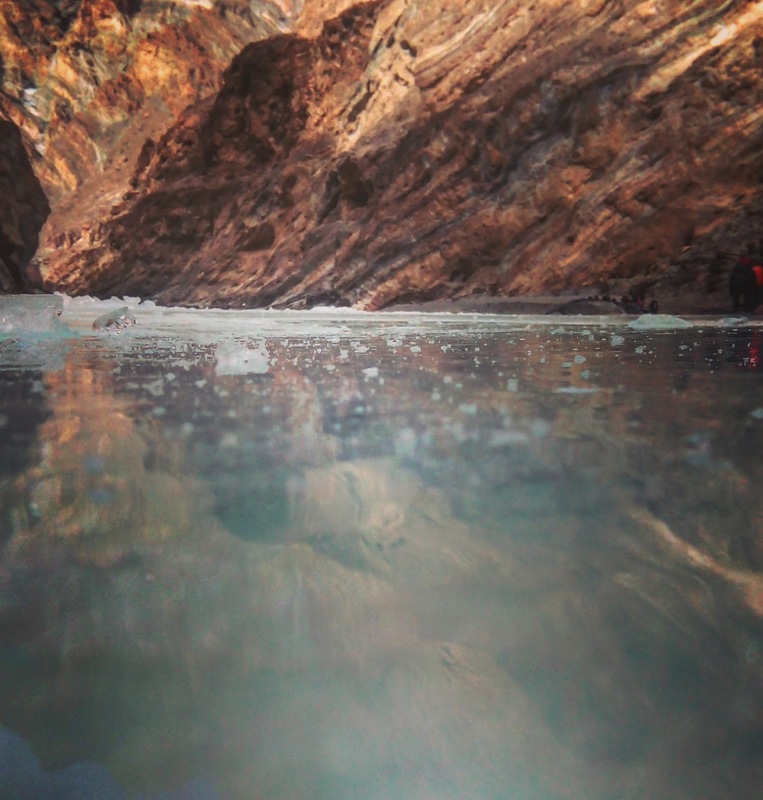 The Chadar trek has been labeled as one of the ‘must do’, but at the same time the trickiest and mind boggling challenges for even the hardened adventure travellers. It has all the elements you need to be ‘branded’ as a mountaineer and despite the grueling nature of the trek it has become a sort of measure of your capabilities, your mind and self-belief. “Don’t turn, don’t stop and keep moving” said young Dorje as I struggle to gather all my limbs and get up from my umpteenth fall on the hard ice. Just as I think I have mastered my glide through the glassy terrain, the whole topography changes to shards of ice that crackle and crumble at your feet. With confident co-trekkers walking by ,I stop and share a smile but even that momentary distraction from the rhythm makes me lose, not only my concentration but once again my grip . Our days are very organized; we set out after a hearty breakfast , stop only for lunch and aim to reach the next Base Camp before sundown. 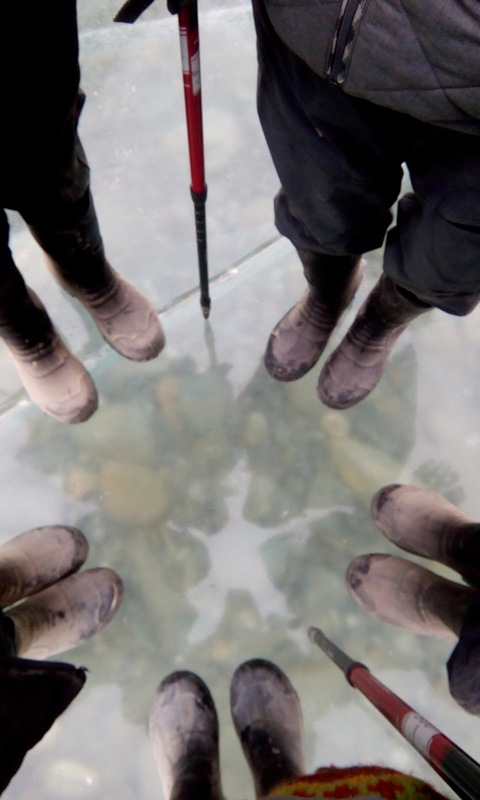 Each day we set out to walk at least 12-15 km and hope that the river has chosen to be kind to us. 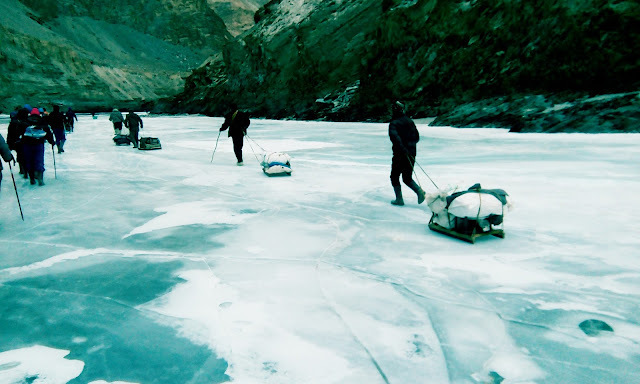 Every single day on the Zanskar is a mystery,until you get to the next turn you have no idea what you will find. 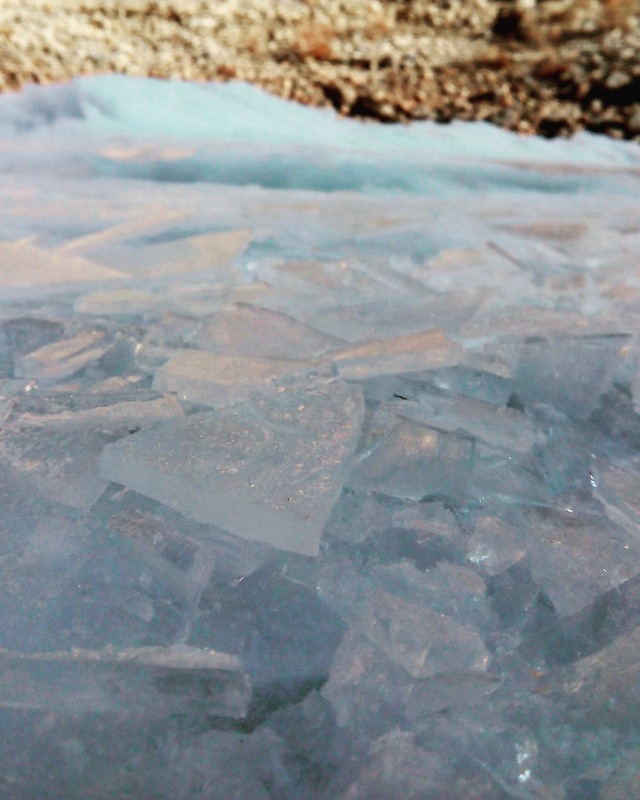 You could be welcomed by a perfect Chadar, a dreamy snowy kingdom , the risen waves, the shardy ice or even icebergs that have chosen to block the path . No drink on earth can taste better than the local tea handed over to you as you approach base camp, no meal on earth can taste better than the stove made dinner served lovingly by the angels . The dinner tent is nothing short of the feeling of having a warm, cozy fire in your home , full of warmth and love. For the most part of the evening we ‘d sit together like a family , joking, laughing, and eating and talking about our lives rather than just the cold. The cold is unbearable and with the icy drop in temparutare you know that the night ahead is not a typical 'rest'.We would all be lying if we said we didn't hope for a miracle to get the number of nights reduced. It has been said "The best way to cheer yourself is to try to cheer someone else up." and it is something similar that got all of us through our doubts . 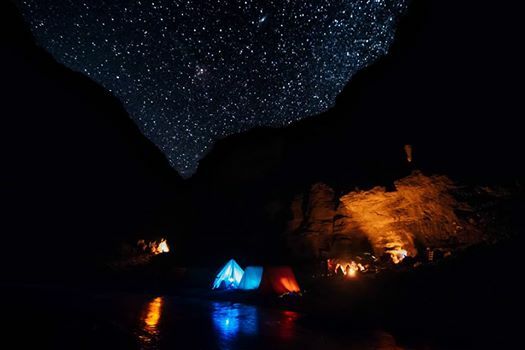 As you step out of the tent onto the frozen or even towards melting streams, to stretch out and get some movement into your numb toes and while waiting for the porters to light up a makeshift bonfire, you gaze at the inverted reflection of the sky and realize that you are about the witness ‘Magic’ . As the twilight fades to darkness, burning away the fatigue of the day, you look up to be stunned by the view. Every worry, every pain, every person you know and even every moment you have cherished seems so small and insignificant in the vast cosmic arena. You can do nothing but stare into the seemingly endless empty space, adorned by the hauntingly unreal cluster of stars, galaxies and more. Each night we did something I never imagined was possible, we lay down on the cold rocks, sand and stones and followed the movement of the International space station. Visible to the naked eye, it looks like a fast-moving plane only much much much higher. Bedtime is like another expedition of its own , your hands are cold from the -20 chill and further dropping temperatures and even ‘normal’ jobs like unzipping your bag, or opening the tent or holding a plate feels impossible. I give up and crawl frozen into my orange tent, that will be my home for the next few days. With experience we have learnt that we are not very good at ‘tucking’ ourselves into bed , so we keep over half an hour of day light to set and organize the triple layered sleeping bag, the only hope of not ending up like a popsicle in the morning. Shital and I have now learned to ignore each other’s complaints, the moaning and the groaning through the night as we struggle to keep the sleeping bag chains up and have our own personal workout sessions at a random hour. We finally give up on the idea of trying to get comfortable and decide to fall asleep. I suddenly realise I need to pee, the fear has set in, of facing the tedious task of getting out of the bag, of opening the tent to welcome the gust of frozen wind on your face , the walk to a secluded spot and the whole process of starting over. It is at such moment I wish I had an ‘organ’ that would allow me to pee into a bottle , after about half an hour of convincing myself I get out in anger and frustration and curse my luck. 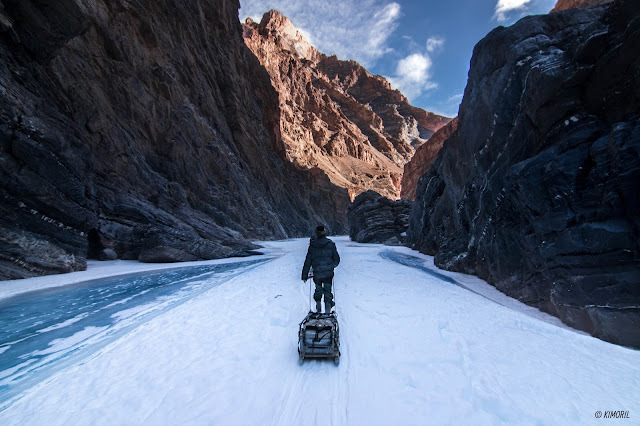 The mornings on the Chadar start at 5:00 am, they begin with warming up the frozen toothpastes and sunscreens and within the hour we are back on the frozen river to head to the next camp and our next stop. Having spent a number of days on the ice and having witnessed a number not to lucky trekkers on the route, I thanked my stars that none of those numerous nasty falls within the group lead to a broken jaw, a cracked elbow or a bloody nose. The impact with the hard ice surface can cause significant bruising and something as simple as a slip can lead to a backward tumble and can cause the head to strike the ice. Today was to be a special day with our team heading together to the ‘trophy’, the end of our first leg , which was basically the end of our Half way point . It is a relaxed morning with the group of trekkers and guides and Sherpa with lots of fun and smiles. 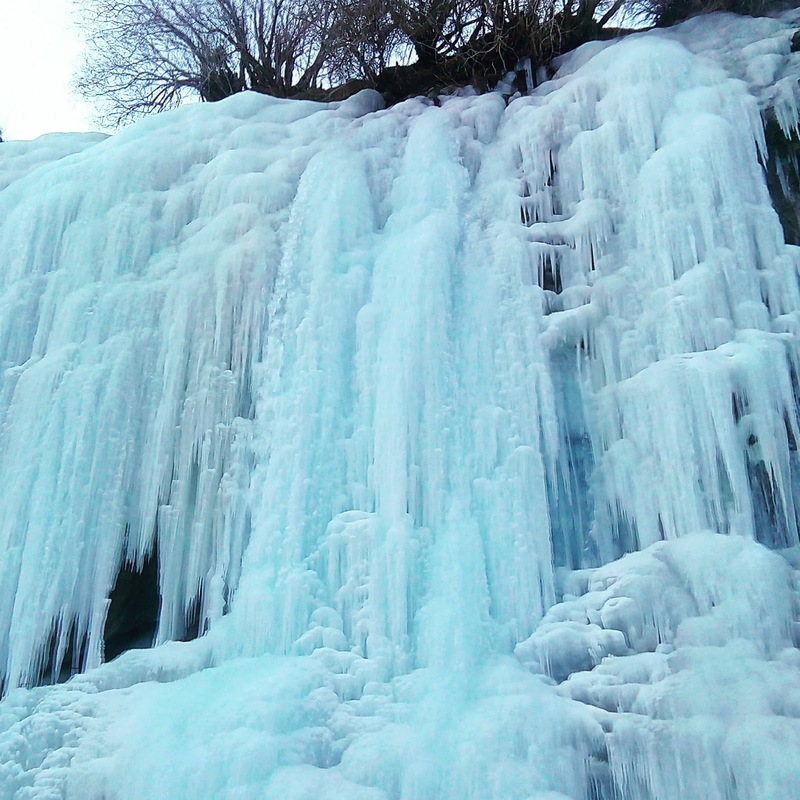 But at one point as we turn a corner under the old bridge , the group becomes silent : The Nerak frozen falls came into full view. I stood quietly for a moment as our team erupted with cheers at the view combined with gasps and a few tears. As I glanced into my teammates faces, I saw my own. I saw my dreams, my experiences, my emotions. We have often wondered how people get through days of meditation and imagine the feeling of de-stress at the end of it, I am today confident after my days on the Zanskar we have found that feeling. This is amazing and superbly written. Being your co trekker in the group was a real fun and thanks for this wonderful write-up. 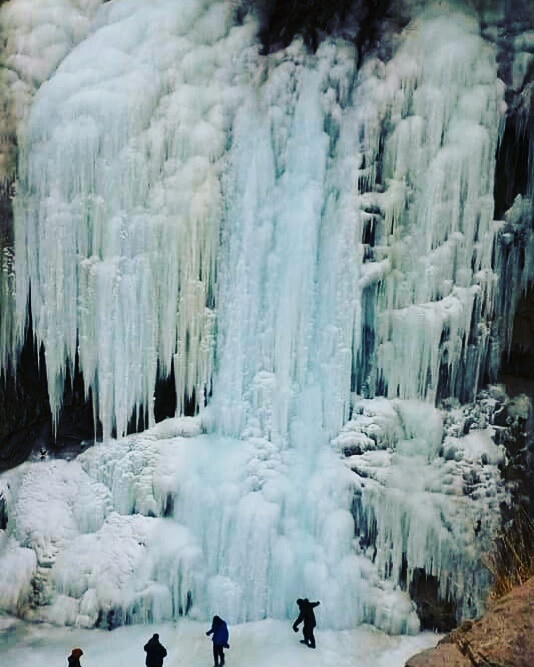 ohh...wow great post and useful information about zanskar river...it is so wonderful place..i also visit this place and so amazing as you describe.. i visit this place with travelroach.. here is the link..https://travelroach.com/trip/zanskar-trek.